18 months for the 10 cm pot, 24 months for the 14 cm pot ! 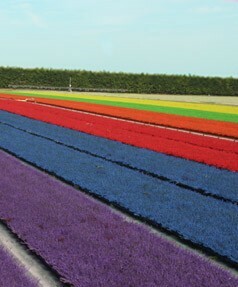 a callunas producer, specialist in coloured callunas. This website has been designed for professionals only. Calluna Vulgaris is the heather that we all know and love. 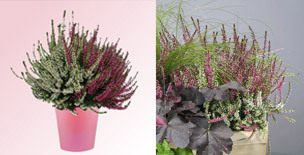 We have grown, dyed and styled up the same heather to showcase it in flowerbeds, pots and window boxes. 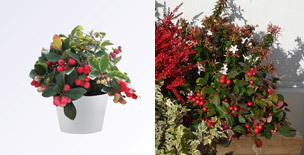 Its signature features are unchanged: perennial, resistant to heavy frost, rustic, easy, bright and precious all at the same time. Our process consists in a thin-layer of natural dye using a unique dye machine tailored in-house. 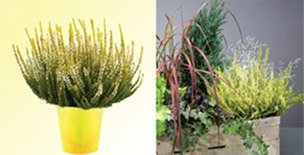 The dye sticks to the bud while letting its foliage shine through. The colours keeps bright all winter and the heather remains perennial. 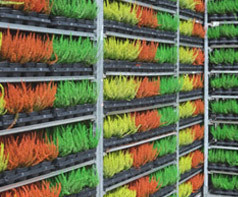 Our modern production tool and eco-friendly production site contribute to our monoculture’s success. With an unrivalled fast delivery, Callunas d’Alsace offer services such as changing pots, labelling, mix in crates, etc … Our delivery time is 1 to 2 days. Delivery possible from rolls 4 CC in Europe.